This is an advertisement for Cadbury's Cocoa. 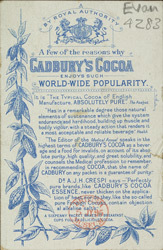 In 1866 the Cadbury brothers introduced their Cocoa Essence which was the first cocoa which could be used for cooking and drinking. The brothers were prominent Quakers and had string beliefs in equality and social reform. They built their factory on a large site in Birmingham and built housing for their workers in a village that they named Bournville. They also provided their employees with education and medical care as well as a range of sporting and recreational opportunities. They believed that a healthy and happy lifestyle would boost the morale of the workers.